IN THE early 1990s when Hj Wahab Jumat was at his peak as a pemukun providing traditional entertainment at weddings, he at one time earned almost $2,000 in one month. “Every week we would be invited to perform at a wedding. There were so many requests we had to decline sometimes,” he says. That was back in the day when memukun, a form of entertainment that involves the exchange of poems between a male and a female performer, was still popular in Brunei. 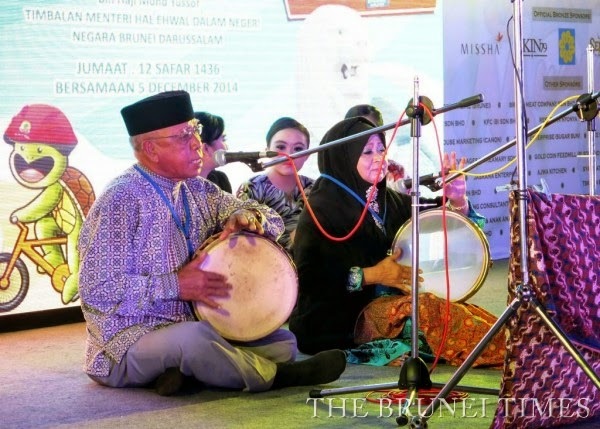 These days, 74-year-old veteran pemukun Hj Wahab no longer gets as many invitations and when he does, it is normally to perform at a cultural event organised by a government agency. The pemukun, usually the elderly people who exchange pantun poems while traditional music is being played, have been pushed to extinction by modern-day forms of entertainment, including karaoke sessions at weddings. HIS Majesty Sultan Haji Hassanal Bolkiah Mu’izzaddin Waddaulah, the Sultan and Yang Di-Pertuan of Brunei Darussalam, and Her Majesty Duli Raja Isteri Pengiran Anak Hajah Saleha last night joined Southeast Asian leaders for a gala dinner, ahead of their meeting today. Malaysian Prime Minister and ASEAN Chair Najib Razak and his spouse hosted the dinner at the Kuala Lumpur Convention Centre’s banquet hall. In his speech during the dinner, the prime minister said with this year’s theme, ‘Our People, Our Community, Our Vision’, the focus is on the creation of a ‘people-centred ASEAN’ to translate that into a tangible reality. 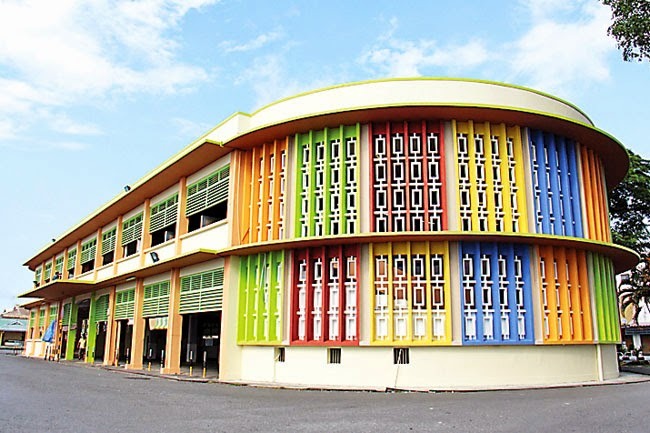 THE old market building along Jalan McKerron of Kuala Belait under the jurisdiction of Kuala Belait-Seria Municipal Department has got a facelift with new painting which highlights a more attractive theme. The weekly Night Market has been ongoing at the ground floor of the building every weekend (Friday, Saturday and Sunday) since September 24, 2011. Various food items are available at the market such as cakes, fried noodles, soto, burger, nasi katok, and grilled food among others. During the revamp, repair works have also been done including cleaning of the area. The Kuala Belait-Seria Municipal Department informed that it wishes to fulfill the public’s wish for more daily choices and will strive to support local entrepreneurs by providing appropriate places for them. TRADITIONAL instruments such as guriding, tangkong and gandang sadaman have lost their appeal among the younger generation, but veteran musician Hj Nayan Apong has not given up on them. 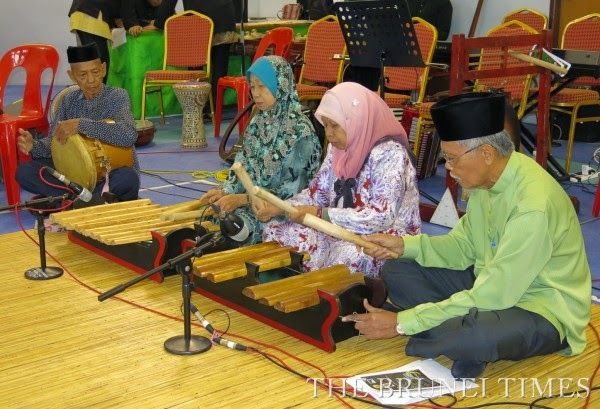 The 86-year-old from Kampung Kulapis reminisces how the sound of these instruments used to resonate in paddy fields across the sultanate. The Kadayan Malays used to play them while they tended to their farms, Hj Nayan says. It’s a forgotten art, but he still enjoys playing them and crafting them by hand. One of the earliest instruments he learned to play was the guriding. “I began playing the guridingwhen I was very young, in my early teens,” Hj Nayan says. HER Majesty Duli Raja Isteri Pengiran Anak Hajah Saleha Al-Marhum Pengiran Pemancha Pengiran Anak Hj Mohamed Alam yesterday graced the official opening of the $69.2 million Women and Children’s Centre at the Raja Isteri Pengiran Anak Saleha (RIPAS) Hospital. Her Majesty was welcomed by the Minister of Health Yang Berhormat Pehin Orang Kaya Johan Pahlawan Dato Seri Setia Hj Adanan Begawan Pehin Siraja Khatib Dato Seri Setia Hj Md Yusof upon arrival, before proceeding to the Obstetrics and Gynaecology Clinic where she listened to a brief introduction of the recently completed centre by the Minister of Health. She then officiated the centre and watched a video showcasing the extensive facilities, before proceeding to the Paediatric clinic to sign a commemorative plaque. Her Majesty then toured several floors, interacting with patients, doctors and other health professionals. THE two-day Asian African Summit 2015 began yesterday in Jakarta, where 21 heads of state/government and delegates from 106 countries, 15 observer countries and 10 international organisations gathered to forge closer ties and find solutions to resolve the current challenges facing by the two continents. 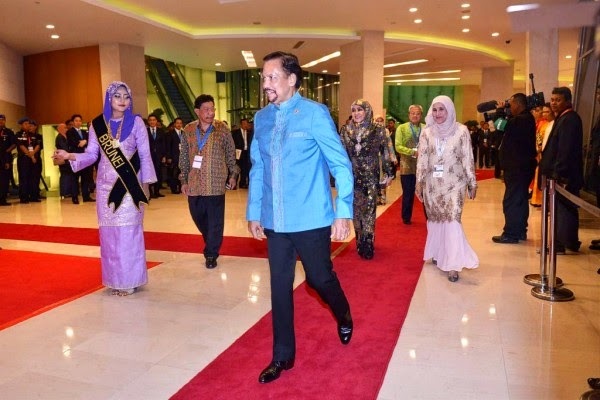 His Majesty Sultan Haji Hassanal Bolkiah Mu’izzaddin Waddaulah, the Sultan and Yang Di-Pertuan of Brunei Darussalam, was among the 21 heads of state/government who had flown in to the Indone-sia’s capital to attend the Leaders’ Summit of the 60th Commemoration of the Asian African Conference 2015. Other leaders include Japan’s Prime Minister Shinzo Abe, Iran’s President Dr Hassan Rouhani, China’s President Xi Jinping and Zimbabwe’s President Robert Mugabe. 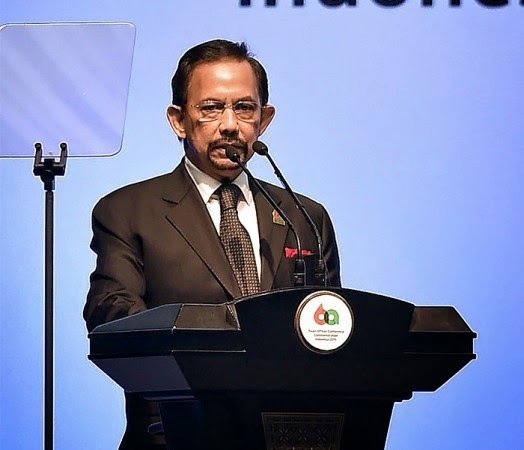 They were welcomed by Indonesia’s President Dato Laila Utama Joko Widodo, who is the host of a series of events for this year’s commemoration, held at the Jakarta Convention Center. MILITARY ties between Brunei Darussalam and Australia are set to be enhanced following the launch of Exercise Penguin 16/15, a bilateral exercise conducted biennially between Royal Brunei Navy (RBN) and Royal Australian Navy (RAN). 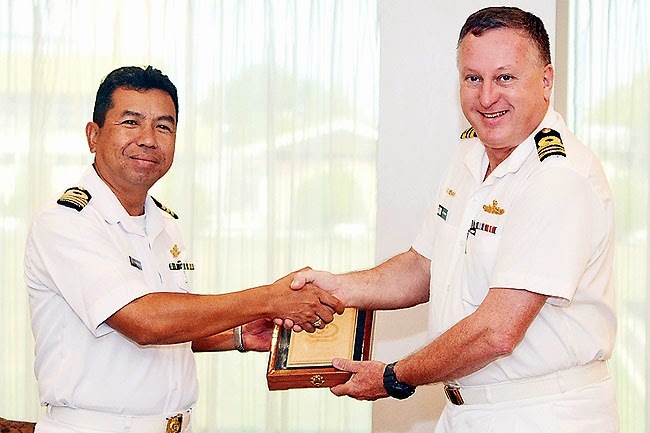 Lieutenant Colonel (L) Pengiran Mohammad bin Pengiran Haji Damit, Fleet Commander of the Royal Brunei Navy, said the objective of the exercise was to strengthen the relationship between both parties through operational and naval practices. “I am confident that the exercise will achieve its objectives,” he said during the opening ceremony at the Muara Naval Base, adding that both navies had been working together for the best part of the last decade. “The exercise has evolved over the years, from practising basic seamanship and communication evolution to multi-dimensional warfare scenarios. Banks in Brunei Darussalam have so far weathered the impact of falling oil prices, winning plaudits from credit rating agencies for their resilience and stability. Credit ratings agency Standard & Poor’s (S&P) said in early March that the Sultanate’s strong economic base had dampened the effects of the drop in oil prices on the banking sector, echoing the view of the central banking authority, the Autoriti Monetari Brunei Darussalam (AMBD), earlier in the year. LOCATED at the famed and historical water village of Brunei Darussalam is the Kampong Ayer Cultural and Tourism Gallery. 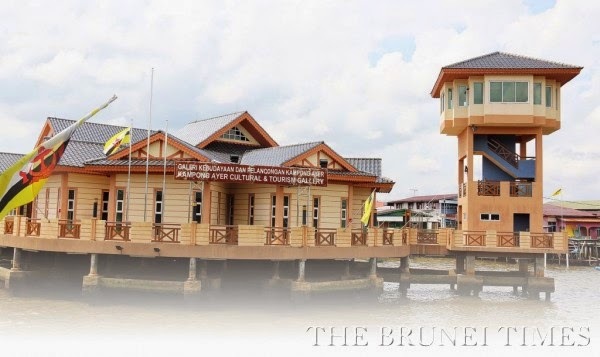 This unique gallery — with an enclosed area of 565 square metres — was established to provide visitors and locals a glimpse into Kampong Ayer’s celebrated past while preserving part of Brunei’s heritage as well as to assist in rejuvenating the cottage industries in the area and diversify the local economy. The $3 million centre was inaugurated by His Royal Highness Prince Haji Al-Muhtadee Billah, the Crown Prince and Senior Minister at the Prime Minister’s Office in August 2009. The gallery is built in the style of a grand house and is managed by the Tourism Development Department, Ministry of Industry and Primary Resource. 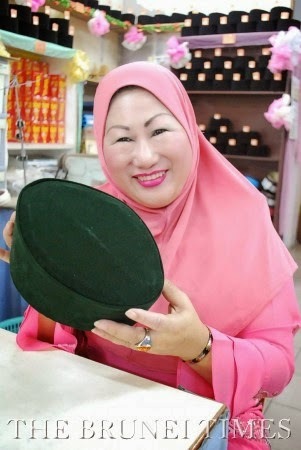 “PRACTICE makes perfect”, was an old adage emphasised by Siti Aishah Salleh, 52, the manager of Syarikat Aisma Aishah, when she gave The Brunei Times an insight into the songkok-making craft. Songkok is a traditional headgear worn by males, primarily in Malay community, to complete a customary attire, especially during formal occasion or any religious events. The headgear is also part of the school uniform worn by male students. Siti Aishah, who was the overall winner in the Compulsory Sinjang (traditional woven cloth worn around the waist for males) and Creative Sinjang Category at the Making and Wearing of Dastarand Sinjang National Competition last year, saw a niche in the local market that was worth investing for its uniqueness. According to her, she was inspired to learn the craft by her cousin, who she spent some time observing making the songkok, when she was young. Midland businesses in the food, pharmaceutical and fast-growing biotech sectors are being urged to explore opportunities in Brunei as the country seeks to position itself it the centre of the halal products industry. 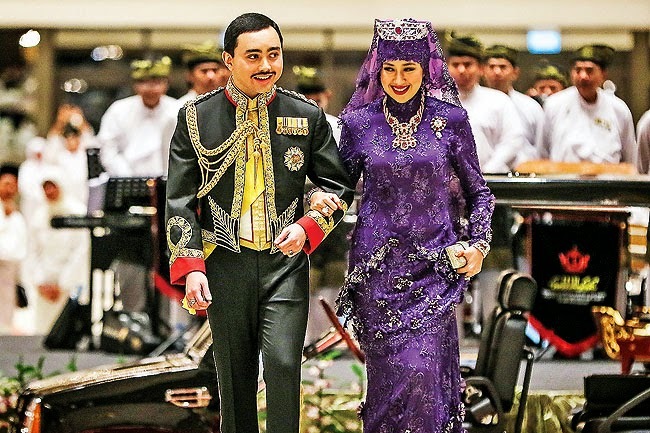 THE week-long glittering celebration of the royal wedding ceremony between His Royal Highness Prince ‘Abdul Malik and YAM Pengiran Anak Isteri Pengiran Raabi’atul ‘Adawiyyah binti Pengiran Haji Bolkiah concluded last night with a dazzling royal banquet (‘Istiadat Persantapan Pengantin Diraja’) ceremony at the Istana Nurul Iman. Gracing the event were His Majesty the Sultan and Yang Di-Pertuan of Brunei Darussalam and Her Majesty Raja Isteri Pengiran Anak Hajah Saleha.